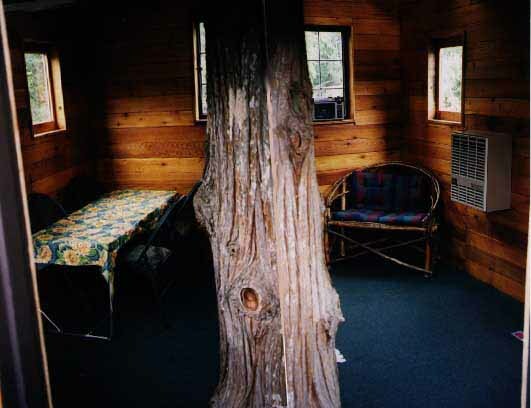 Welcome to the Cedar Creek Treehouse. Now, imagine having your own state park for a weekend with a clear mountain stream flowing by your cabin as you peer from the canopies of a lush rainforest. Blue herons glide overhead, all the while… you’re in a cabin with a mammoth tree trunk growing straight up through the floor of your kitchen and disappearing through the ceiling. Your adventure also includes a one-hour guided tour of the Stairway To Heaven, Rainbow Bridge, and Treehouse Observatory, where guests can video, photograph, use the binoculars, and enjoy incredible views of Mt. Rainier and the Nisqually Valley from 100 feet in the sky. Cedar Creek Treehouse is an Earth-friendly, privately owned and operated mountain retreat, located “one mile as the crow flies, 10 miles by car, from the Nisqually River Entrance to Mount Rainier National Park bordering the Gifford Pinchot National Forest.” They offer unique treehouse vacation rental lodging with this bed and breakfast cottage 50 feet up in a 200-year old Western Red Cedar tree. 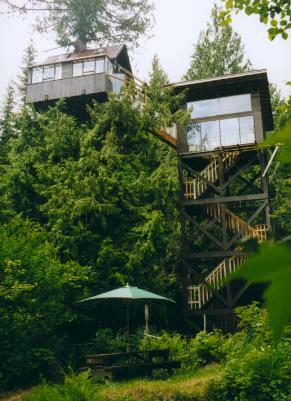 The new addition of their Treehouse Observatory (and its “Stairway to Heaven” access) – gives some spectacular mountain views 100 feet high in a nearby fir tree – to redefine the concept of a treehouse resort. It’s $300/night worth of cool, that’s what.